June | 2014 | Om nom nom! This was another of the freezer meals we put together about a month ago. Shawn is out of town and this is easy and in the freezer and it’s possible we have no food at ALL in the fridge. So it worked out. 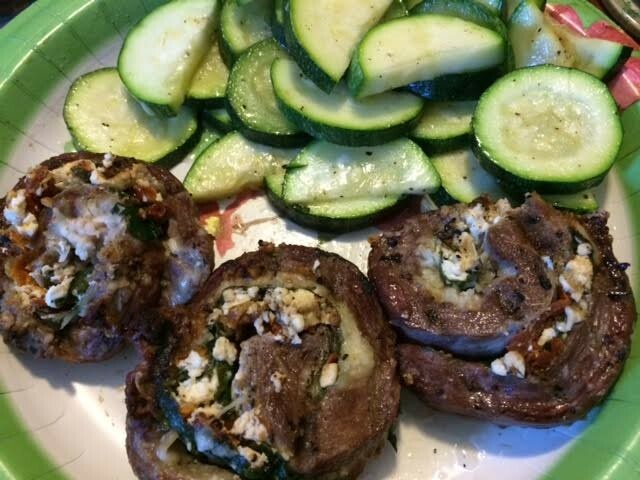 I want to say that the best part was the side of the first zucchini from our garden (also grilled), but the pinwheels were pretty good! 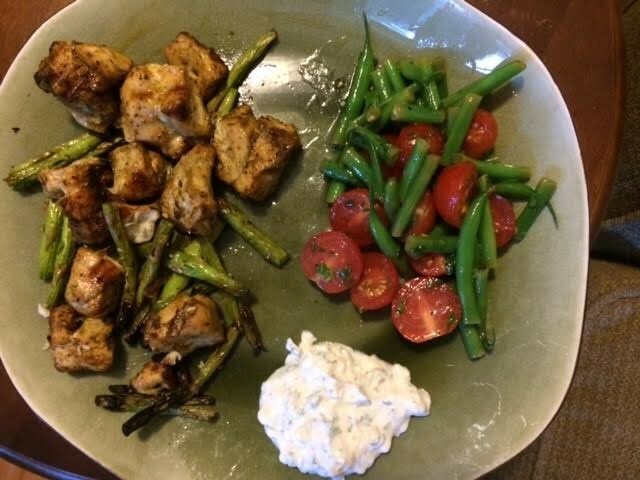 They were a little messy on the grill, but for something you can pull out of the freezer and more or less throw on the grill I’m a fan! This is pretty much awesome, and I made it twice in one week, once for us and once for my Mom while she was visiting and our friends who came over to visit. The original recipe has a lemon vinagrette that you can drizzle over the kabobs, but I skipped that given the dipping sauce was SO good. Made the meal, I think. We had this with green bean and tomato salad, and a quinoa/veggie salad. Great summer meal! 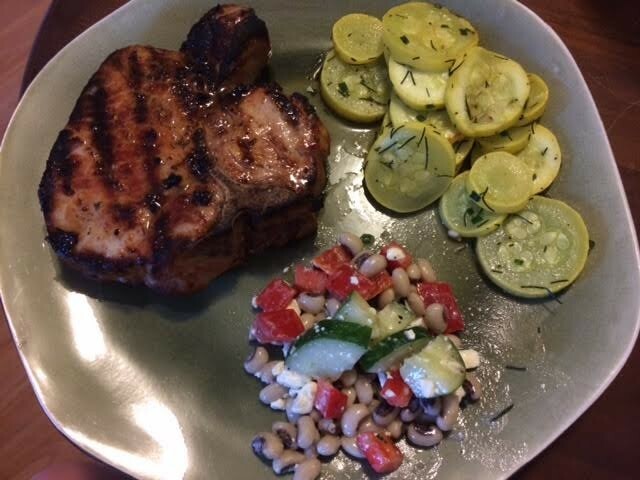 The more we try different recipes, the more I think pork chops are pretty much my favorite thing on the grill. And this was probably my favorite recipe to date. The only thing I’d change is to add more garlic and sage to the rub next time…and it is still great as is! Otherwise…awesome! We served this with some grilled squash and cucumber and black eyed pea salad. These are a pretty summer dessert that go a long way – one batch makes a lot. 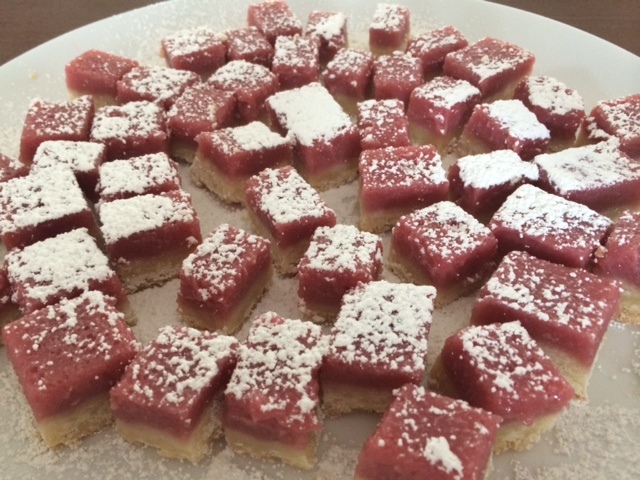 Recipe from Smitten Kitchen, called pink lemonade bars. Shawn taste-tested (I’m allergic to raspberries – these are for a friend), and he thought they were very good but could be a little more tart. So if you’re a fan of tart lemon flavor (I am! ), adjust that and maybe tone down the berries. I did taste the crust and thought it was quite good. I’d make again, though I think next time I’ll substitute blueberries so I can enjoy! So this was great. Probably we’re just enamored with any good pork chop recipes right now, but this is seriously worth a go. I like how adjustable it is. I actually think the “sauce/vinagrette” would be even better over fish, so I’ll use it again for that. 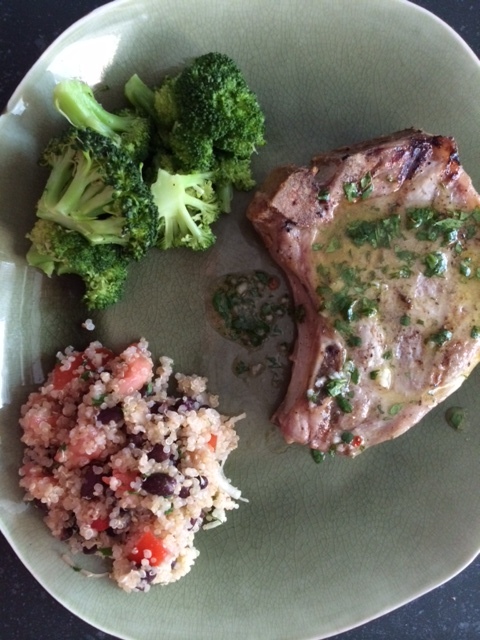 We served this with steamed broccoli and tomato and black bean quinoa.